"What a joy to see the sky filled with 'a flutter of butterflies'; hand painted fabric 'kites' floating on the gentle breeze." Artist comment: "Certainly one of the most delightful handmade train of kites I observed at the Washington State International Kite Festival (WSIKF) was this unique train of butterfly kites. I watched enthralled as I made sketches and took notes as I talked with the lovely couple who created them. In my studio I put them on pastel paper and was thrilled once again as they emerged one at a time as though fresh from the cocoon and into a glorious blue sky." "A Flutter Of Butterflies" is a 24" X 18" pastel painting on Mi-Teintes paper. 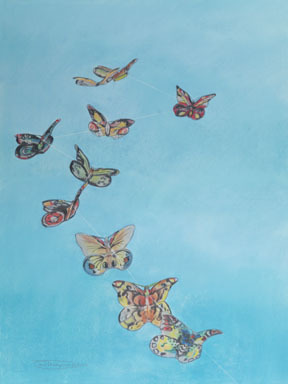 "A Flutter Of Butterflies" is a limited edition, giclée print from an original pastel painting by Carol Thompson. The edition includes 3600 authorized, signed, limited edition prints (3500 numbered and 100 artist proofs). Release date is October 2015. Image size and substrates vary. All prints are signed and numbered by the artist and include a certificate of authenticity. Paper prints are shrink wrapped on foam board. Canvas prints are coated with a protective spray.